Home / Family / How to Get Your Guy in to Yoga! How to Get Your Guy in to Yoga! When was the last time you asked your boyfriend or husband to join you for your yoga class? The ratio of women to men who practice yoga is something like 80-20. A 2012 survey by Yoga Journal found that of the 20.4 million people who practice yoga in the United States, only 18 percent of them are men. But, the man in your life (as well as your relationship) can greatly benefit from the practice. Several studies have linked practicing yoga with a reduction in lower back pain and improved back function. Other studies suggest that having a regular yoga regimen lowers heart rate and blood pressure; helps relieve anxiety, depression and insomnia; and improves overall physical fitness, strength and flexibility. All of these benefits are incredible for the man you love. It’s important to share yoga with the man in your life because it’s one of the few things you can actually do physically at the same level. Yoga is a relaxing activity that has the power to tap deep within your being and pull out emotions you didn’t even know existed. Being part of such an experience together can do wonders for your relationship and bring it to the next level. If you do couple’s yoga you’ll develop trust, coordination and teamwork. Try some easy poses at home or download a yoga video to do together. 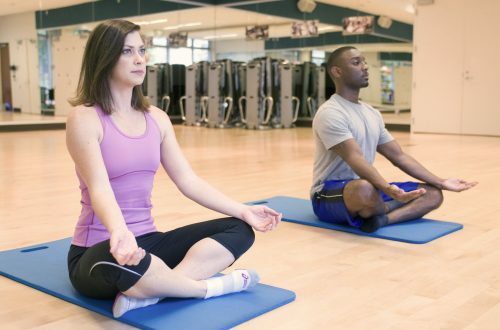 One of the biggest issues you might find in trying to convince him to join you for yoga class, is that it all seems a bit forced and he feels like he’s being reeled into something. By giving him the necessary time to try the water before jumping in, you help build up his confidence. Tell him about his favorite athlete such as Shaquille O’Neal, LeBron James, Ray Lewis, or Victor Cruz. When he realizes “real men” practice yoga, he will be more likely to join. Find a teacher who plays a great soundtrack and has a down to earth manner. The man in your life might shy away from someone who chants, plays spiritual music or has a very “yogic” disposition. He will feel much more comfortable in a class where the teacher is low key. Invest in the right gear. My husband sweats ALOT! I got him a yogi toes towel to place over his yoga mat and instead of letting him wear his old sweats, I invested in some yoga pants for him. Here’s a list of some of the best mens yoga pants. Also make sure he has a somewhat fitted tee shirt so it doesn’t fly up in his face in downward facing dog. I personally love doing yoga with my husband. I feel more bonded and I love that it is something that is so good for his health and well being. Let me know if you practice with you man and any tips you may have! When H20 just doesn't cut it! Tax Day Relief Yoga Poses! Kristin McGee is a celebrity yoga and Pilates instructor in New York City. She is currently teaching yoga with Peloton. She is the star of over 100 videos, seen in several magazines and tv shows and is a spokeswoman for many brands and causes she believes in. A proud mom to three, she sure keeps herself busy! Love it! I have been asking my boyfriend for two years to practice with me! He finally did this past Thursday at the Hindu cultural center in my town. I chose that class specifically because this older man was teaching that evening and I knew he takes it slow, and doesn’t do anything fancy. It truly is a traditional yoga class with pranayama and meditation. It turned out just being my boyfriend, me and the instructor. Perfect setting for him to experience just breathing on the mat. I didn’t want to scare him away with an athletic practice filled with flexible women. There was even some chanting, he was Om-ing along with us. Great experience! That’s so awesome love to hear it!!! Enjoy a private yoga, Pilates, or personal training session with me in the comfort of your home, private studio, or location of your choice. I customize and tailor each session to each client’s needs. You get unique personal attention, support, and the encouragement to meet your fitness, health, and wellbeing goals. Are you ready to commit to your fitness goals and see real results?